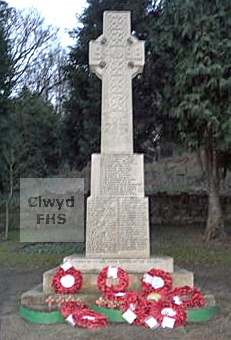 The Caergwrle War Memorial commemorates those men of the area who died during World War I and World War II. The memorial, in the form of an ornately carved Celtic Cross, stands in a small garden off the Wrexham Road. Many of those named also appear on the Hope War Memorial. Caergwrle is a village in the community of Hope in Flintshire. Between 1974 and 1996 the area was in the county of Clwyd. (Syren Forces) 1 Feb 1919 36 Son of Richard and Emma Asbury; husband of Mary Elizabeth Asbury, of Belle Vue Terrace, Penyffordd. Also named on the Broughton (Flintshire), Hawarden, Hope and Penyffordd War Memorials. Murmansk New British Cemetery, Russia. (9th Bn.) 29 Apr 1917 21 Son of George and Millicent Bate, of 51, Colville Gardens, Bayswater, London. Also named on the Hope and Rhostyllen War Memorials. Queant Road Cemetery, Buissy, Pas de Calais, France. (10th Bn.) 16 Aug 1916 23 Nephew of Jane Sarah Edwards, Bryn Griffith, Cymmau, Wrexham. Also named on the Hope War Memorial. Guillemont Road Cemetery, Guillemont, Somme, France. Harold Stafford General List & Egyptian Labour Corps 17 Nov 1917 34 Son of Alfred and Hannah M. Collins, of Leicester. Also named on the Hope War Memorial. Hadra War Memorial Cemetery, Alexandria, Egypt. WR/274991 Royal Engineers (279th Railway Coy.) 14 Jan 1919 29 Son of John and Harriet Davies, of Meadow View, Caer Estyn, Hope, Wrexham. Also named on the Hope War Memorial. Lille Southern Cemetery, Nord, France. 30303 8th Bn. Royal Welsh Fusiliers 20 Dec 1916 19 Son of William Davies, Sunny Bank, Caergwrle, Wrexham. Also named on the Hope War Memorial. Basra Memorial, Iraq. ( "A" Bty. 241st Bde.) 11 Sep 1917 21 Son of Ithel and Rose Hannah Davies. Also named on the Greenfield, Hope and Penyffordd War Memorials. Vlamertinghe New Military Cemetery, West-Vlaanderen, Belgium. (17th Bn.) 8 Oct 1918 25 Son of George and Harriett Davies, of Bryhyfryd Horeb, Caergwrle, Wrexham. Also named on the Hope War Memorial. Vis-en-Artois Memorial, Pas de Calais, France. (12th Bn.) 22 Nov 1917 24 Son of Mr. and Mrs. J. H. Edwards, of Bryn Arthur, Caergwrle, Wrexham. Also named on the Hope War Memorial Cambrai Memorial, Louverval, Nord, France. ("V" 5th Heavy Trench Mortar Bty.) 24 May 1918 39 Son of Thomas and Rachel Edwards, Cymmau, Hope. Also named on the Hope War Memorial. Mesnil Communal Cemetery Extension, Somme, France. (1st Bn.) 5 Sep 1916 Son of John Evans. Also named on the Hope War Memorial. Mendinghem Military Cemetery, West-Vlaanderen, Belgium. (1st Bn.) 31 August 1916 35 Brother of Mr. T. G. Griffiths, of Rose Cottage, Penyfford, Flints and brother of Frank Griffiths below. Also named on the Hope and Penyffordd War Memorials. Serre Road Cemetery No. 2, Somme, France. (8th Bn.) 6 Nov 1918 34 Brother of Mr. T. G. Griffiths, of Rose Cottage, Penyfford, Flints and brother of Arthur Griffiths above. Also named on the Hope and Penyffordd War Memorials. Awoingt British Cemetery, Nord, France. (1/5th Bn.) 23 Jul 1919 Son of Edward and Ellen Griffiths, Caergwrle. Also named on the Hope War Memorial. Hope Cemetery. (8th Bn.) 16 Feb 1917 20 Son of John F & Elizabeth Griffiths, of 15, Washington Street, Liverpool, England. Amara War Cemetery, Iraq. 202750 Welsh Regiment (15th Bn.) 4 Oct 1918 23 Son of William and Mary Jane Griffiths, Cemetery Road, Hope. Also named on the Hope War Memorial. Terlincthun British Cemetery, Wimille, Pas de Calais, France. (HMS Viknor) 13 Jan 1915 19 Son of Mabel Hastings Hamilton and the late John Roger Hamilton. Sunk by mine off Tory Island, County Donegal, Ireland. Also named on the Hope War Memorial. Portsmouth Naval Memorial, Hampshire, England. ("C" Bty. 95th Bde.) 15 Oct 1917 19 Son of George & Mary A Harley, Stryt Isa, Hope. Born in Kinnerton. Also named on the Higher Kinnerton and Hope War Memorials. The Huts Cemetery, West-Vlaanderen, Belgium. (5th Bn.) 26 Mar 1917 20 Son of William and Mary Hemmings, of The Cottage, Penyffordd, Chester. Also named on the Hope and Penyffordd War Memorials. Jerusalem Memorial, Israel and Palestine (including Gaza). (10th Bn.) 18 Nov 1916 20 Son of the late Thomas Henshaw. Also named on the Hope War Memorial. Hope Cemetery. (1st Regt.) 16 Jul 1916 40 Born in Bagillt, Flintshire. Son of Gilbert and Emma Mary Howell. Holywell Road, Northop. Also named on the Hope and Northop War Memorials. Delville Wood Cemetery, Longueval, Somme, France. 67583 Cheshire Regiment(15th Bn.) 23 Apr 1918 19 Son of Mrs. Lucy Griffiths, of Queen's Cafe, Caergwrle, Wrexham. Also named on the Hope War Memorial Pozieres Memorial, Somme, France. (11th Bn.) 6 Nov 1918 19 Son of John and Mary Ithell, Babylon, Higher Kinnerton, Dodleston. Also named on the Hope and Higher Kinnerton War Memorials. Terlincthun British Cemetery, Wimille, Pas de Calais, France. 74317 & 25719 Notts and Derby Regiment (Sherwood Foresters) Regiment (11th Bn. ) formerly 11th Bn. Lancashire Fusiliers. 22 Oct 1918 28 Son of William and Ann Ithel, The Nant, Hope. Also named on the Hope and Higher Kinnerton War Memorials. Honnechy British Cemetery, Nord, France. (9th Bn.) 3 Jul 1916 36 Born Rhosnesni, Denbighshire. Son of Frank and Hannah Elizabeth Jenkins, Lower Street,Hope. Also named on the Hope War Memorial. Thiepval Memorial, Somme, France. (1st Bn.) 4 Sep 1917 26 Son of Hugh and the late Annie Jones, of Caergwrle, Flintshire. Also named on the Hope War Memorial.. Canada Farm Cemetery, West-Vlaanderen, Belgium. (4th Bn.) 16 Oct 1915 21 Son of William and Emily Jane Jones, 12 Hopstone, Bridgenorth (1911 England Census). Also named on the Hope War Memorial Loos Memorial, Pas de Calais, France. (122nd Bty. 52nd Bde.) 26 Sep 1918 29 Son of Alfred and Elizabeth Jones, of Hope Village, Flintshire. Also named on the Hope War Memorial. Faubourg D'amiens Cemetery, Arras, Pas de Calais, France. (10th Bn.) 13 Nov 1916 35 Brother of Miss L. Jones, of 3, Rose Cottages, Ffrwd, Wrexham, Denbighshire. Also named on the Hope War Memorial. Thiepval Memorial, Somme, France. (538th Labour Coy.) 2 Nov 1918 27 Son of Jesse & Elizabeth Kendrick, of Hope; husband of Lizzie Ann Kendrick, of 44, Hawarden Road, Abemorddu. Hope Cemetery. (9th Bn.) 1 Aug 1917 33 Son of Richard and Sarah Kilvert, of Clunbury, Salop; husband of Mary Kilvert, of The Cottage, Hope, Flints. Also named on the Hope War Memorial. Bailleul Communal Cemetery Extension, Nord, France. (17th Bn.) 9 Jul 1916 33 Grandson of Elizabeth Moses, Red Lion Hope, Nr Mold. Also named on the Hope War Memorial. Thiepval Memorial, Somme, France. Royal Defence Corps 20 May 1921 Son of John & Elizabeth Martin, of Llay, Denbighshire; husband of Margaret Martin, of Fellows Lane, Caergwrle. Hope Cemetery. 21494 16th Bn. Royal Welsh Fusiliers 23 Aug 1916 Son of Edward and Mary Ellen Messham, Pentrerobin, Hawarden (1911 Census). Brother of Edgar and Gordon Messham (Hawarden War Memorial). Husband of Martha Elizabeth Messham. Also named on the Hawarden, Hope, Penyffordd and Penymynydd War Memorials Essex Farm Cemetery, West-Vlaanderen, Belgium. (8th Bn.) 15 Feb 1917 19 Son of Evan Morris, of Tan-y-Mynydd, Mold Rd., Caergwrle, Flints. Also named on the Hope War Memorial. Basra Memorial, Iraq. (5th Bn.) 20 Oct 1918 19 Son of Thomas Henry and Dorothy Parry, of Police Station, Prestatyn, Flints. Also named on the Hope War Memorial. Romeries Communal Cemetery Extension, Nord, France. (11th Bn.) 7 Sep 1918 24 Son of Edward William and Sarah Ellen Peters, of Plasmain Cottages, Cefnybedd, Wrexham. Also named on the Hope War Memorial. Karasouli Military Cemetery, Polikastro, Greece. 5837 King's Liverpool Regiment - Liverpool Scottish (10th Bn.) 9 Aug 1916 20 Born Wolverhampton, Staffordshire, England. Son of John Francis M and Letitia M Poole, Chester Road, Shotton. Also named on the Connah's Quay and Shotton, Hawarden and Hope War Memorials Thiepval Memorial, Somme, France. ("A" Coy. 12th Bn.) 3 Nov 1918 30 Born in Manchester, England. Son of Peter and Mary Price (nee Whitely), of Ayr. Also named on the Hope War Memorial. Les Baraques Military Cemetery, Sangatte, Pas de Calais, France. (5th Bn.) 11 Aug 1915 23 Son of Joseph and Ellen Pugh, of "Rhyddyn View," Hawarden Rd., Caergwrle, Wrexham; husband of the late Myfanwy Pugh. Also named on the Hope War Memorial. Helles Memorial, Turkey. (2nd Bn.) 3 Nov 1916 Son of Sarah Ann Roberts, Gwalia, Caergwrle. Also named on the Hope War Memorial. Thiepval Memorial, Somme, France. (5th Bn.) 10 Mar 1918 34 Son of Joseph Roberts, of Laburnum Cottage, Penymyndd, Mold, Flintshire, and the late Martha Roberts. Also named on the Hope, Llanfynydd, Penyffordd and Penymynydd War Memorials. Ramleh (Ramla) War Cemetery, Israel. (13th Bn.) 5 Jun 1916 22 Native of Kilburn, London, England. Son of David and Maria Roberts, of Oak Cottage, Hope Village, Wrexham. Also named on the Hope War Memorial. Merville Communal Cemetery, Nord, France. formerly Denbighshire Yeomanry 18 Jun 1917 24 Son of Robert and Jane Roberts, Rhawberfedd, Hope. Also named on the Hope War Memorial. Arras Memorial, Pas de Calais, France. (1st Bn.) 21 Oct 1914 25 Son of the late John and Ann Speed, of High St., Caergwrle, Wrexham, Denbighshire. Also named on the Hope War Memorial. Menin Gate Memorial, Ieper, West-Vlaanderen, Belgium. (5th Bn.) 17 Aug 1915 18 Son of William Thomas, of 5, Coronation Terrace, Abermorddu, Wrexham. Also named on the Hope War Memorial. Helles Memorial, Turkey. (14th Bn.) 3 Aug 1917 33 Son the the late George Edward Trevor-Roper and Harriete Trevor-Roper. Husband of Gertrude Alice Trevor-Roper, of Plas Teg, Mold, Flintshire. Father of Richard Dacre Trevor-Roper (WWII below). Also named on the Mold War Memorial. Duhallow A.D.S. Cemetery, West-Vlaanderen, Belgium. (2nd Bn.) 3 Nov 1914 27 Son of Edward and Hannah Tydd, Burwardsley Road, Tattenhall, Cheshire. Husband of Gladys Tydd, High Street, Caergwrle, Flintshire. Also named on the Gwersyllt and Hope War Memorials. Pont-du-Hem Military Cemetery, La Gorgue, Nord, France. (1st Bn.) 18 Oct 1918 36 Son of Thomas and Martha Vaughan, of Caergwrle, Flints. ; husband of Martha Ann Vaughan, of 99, Hall St., Rhosllanerchrugog, Wrexham. Also named on the Hope War Memorial. Vred Communal Cemetery, Nord, France. (10th Bn.) 16 Aug 1916 27 Son of Thomas and Barbara Wilcock, Bannel. Penymynydd. (1911 Wales Census). Husband of Mary Eleanor Wilcock later Mullard. Also named on the Hawarden, Hope, Penyffordd and Penymynydd War Memorials. Thiepval Memorial, Somme, France. (12th Bn.) 26 Aug 1918 27 Son of Daniel and Ruth Williams, of Caergwrle, Wrexham. Also named on the Hope War Memorial. Aubigny Communal Cemetery Extension, Pas de Calais, France. 185879 Royal Garrison Artillery (287th Siege Battery) 16 Sep 1918 64 Husband of Mary Williams, Brynyffynnon, Caergwrle. Also named on the Hope War Memorial. Varennes Military Cemetery, Somme, France. (HMS Niger) 6 Jul 1942 22 Son of Mr. and Mrs. G. E. Barlow, of Caergwrle, Denbighshire. Also named on the Hope War Memorial. Chatham Naval Memorial, Kent, England. 1142405 Royal Air Force Volunteer Reserve 8 Feb 1946 Born in Hawarden. Husband of Eleanor Bradshaw, of Weston-super-Mare, Somerset, England. Greenbank Cemetery, Bristol, England. (HMS Midge) 1 May 1943 19 Son of Frederick William and Alice Clark, of Caergwrle. Also named on the Hope War Memorial. HopeÂ Cemetery, Flintshire. (65 Field Regt.) 11 Sep 1944 31 Son of William and Annie Davies, of Caergwrle, Denbighshire. Also named on the Hope War Memorial. Gradara War Cemetery, Italy. 1058490 Royal Air Force 6 Mar 1943 21 Son of John Leonard Booth Duxbury and Florence L. Duxbury; husband of Ivy Monica Duxbury, of South Ruislip, Middlesex. Also named on the Hope War Memorial. Bayeux War Cemetery, Calvados, France. T/10673230 Royal Army Service Corps 29 May 1943 21 Son of William H. Edwards and Sarah E. Edwards, of Penyffordd, Flintshire. Also named on the Hope and Penyffordd War Memorials. Tripoli War Cemetery, Libya. (239 Bty., 101 Lt. A.A./Anti-Tank Regt.) 4 Jun 1940 21 Son of Robert and Elizabeth Handley Edwards, of Caergwrle, Flintshire. Also named on the Hope War Memorial. Dunkirk Memorial, Nord, France. 571882 Royal Air Force 2 Mar 1946 25 Son of Seth Henry and Jessie Ellis (nee Shaw). Also named on the Hope War Memorial. Kirkee War Cemetery, India. (3 Bty., 6 H.A.A. Regt.) 9 May 1943 28 Son of Samuel and Ann Ellis, of Pontybodkin, Flintshire; husband of May Louisa Ellis, of Tir-y-Fron, Pontybodkin. Also named on the Hawarden, Hope and Penyffordd War Memorials. Kanchanaburi War Cemetery, Thailand. (156 Sqdn.) 15 Oct 1942 30 Son of C. H. Hobbs and of Rachel May Hobbs (nee English); husband of Vera Winifred Hobbs, of East Bergholt, Suffolk. Also named on the Hope War Memorial. Runnymede Memorial, Surrey, England. PLY/X120073 Royal Marines (48 R.M. Commando) 06 Jun 1944 26 Also named on the Hope War Memorial Bayeux War Cemetery, Calvados, France. 1535818 Royal Air Force Volunteer Reserve 1 Jan 1945 23 Son of Edmund and Alice Jones, of Abermorddu, Flintshire. Also named on the Hope War Memorial. Brussels Town Cemetery, Vlaams-Brabant, Belgium. 1113272 Royal Air Force 8 Aug 1943 23 Son of William Manning Morris and Charlotte May Morris, of Caergwrle. Also named on the Hope War Memorial. Hope Cemetery, Flintshire. (5th Bn.) 2 Aug 1944 39 Son of William Gummow Musgrave and Mary Musgrave; husband of Alma Grace Musgrave, of Hove, Sussex. B.A. Also named on the Hope War Memorial. Hottot-les-Bagues War Cemetery, Calvados, France. (1st Bn.) 22 May 1940 25 Also named on the Hope War Memorial. Dunkirk War Memorial, Nord, France. (HMS Prince of Wales) 10 Dec 1941 25 Son of Richard and Sarah Mary Elizabeth Parsonage, of Caergwrle, Flintshire. Also named on the Hope War Memorial. Plymouth Naval Memorial, Devon, England. (2nd Lothians and Border) 8 Feb 1944 20 Son of Frank and Jessie Pickering, of Caergwrle, Flintshire. Also named on the Hope War Memorial. Bone War Cemetery, Annaba, Algeria. Monmouthshire Regiment 17 Aug 1944 23 Of Hafod Owen, Hope. Son of Joseph and Maggie Reynolds, of Wrexham, Denbighshire. Also named on the Hope, Penyffordd and Penymynydd War Memorials. Banneville-la-Campagne War Cemetery, Calvados, France. T/14398433 Royal Army Service Corps 10 Apr 1945 21 Born Oswestry, Shropshire, England. Son of John Ridge & Mary Elizabeth Ridge (nee Parry), of Caergwrle. Brother of Sidney Robert Ridge (below). Also named on the Hope War Memorial. Turnhout Communal Cemetery, Antwerpen, Belgium. (1st Bn.) 8 Apr 1945 25 Born Shropshire, England. Son of John Ridge & Mary Elizabeth Ridge (nee Parry) of Caergwrle; husband of J M Ridge, of Upton Lovell, Wiltshire, England. Brother of Richard Ridge (above). Also named on the Hope War Memorial. Rheinberg War Cemetery, Nordrhein-Westfalen, Germany. 30 April 1941 21 Son of R. H. Sowery, M.M., and Mrs. A. Sowery, of Caergwrle, Denbighshire. Also named on the Hope War Memorial. Athens Memorial, Greece. EC/15981 Royal Indian Army Service Corps 11 Jun 1942 Also named on the Hope War Memorial. Delhi War Cemetery, India. D.F.C. & D.F.M. Royal Air Force Volunteer Reserve (97 Sqdn.) 31 Mar 1944 28 Son of Charles Cadwaladr Trevor-Roper (WW1 above) & Gertrude Alice Trevor-Roper; husband of Patricia Audry Trevor-Roper, of West Bridgford, Nottinghamshire. Also named on the Hope War Memorial Durnbach War Cemetery, Bayern, Germany. (8 Ind. Div. Sigs.) 23 Apr 1945 24 Son of Richard William and Elizabeth Jane Tudor; husband of Dorothy Prudence Tudor, of Bagendon, Gloucestershire. Also named on the Hope War Memorial. Argenta Gap War Cemetery, Italy. (HMS Thanet) 27 Jan 1942 21 Born in Grantham, Lincolnshire, England. Son of George Henry & Maud Watmore, of Caergwrle. Also named on the Hope War Memorial. Plymouth Naval Memorial, Devon, England. (6th/10th Royal Welch Fusiliers Bn.) 15 Aug 1944 24 Son of Thomas Arden Wilbraham and Florence Elizabeth Williams, of Caergwrle, Flintshire. Also named on the Hope War Memorial. Mazargues War Cemetery, Marseilles, Bouches-du-Rhone, France. (1st Bn.) 29 Apr 1944 33 Husband of Elizabeth Williams, of Caergwrle, Denbighshire. Also named on the Hope War Memorial. Beach Head War Cemetery, Anzio, Italy. 1621067 Royal Air Force Volunteer Reserve 8 Mar 1944 26 Son of Charles and Ada M. Willis, of Penyffordd, Flintshire. Also named on the Hope, Penyffordd and Penymynydd War Memorials. Tripoli War Cemetery, Libya. (20 Anti-Tank Regt.) 20 Jul 1944 29 Son of Edward and Ellen Wright, of Penyfford, Flintshire. Also named on the Hawarden, Hope, Penyffordd and Penymynydd War Memorials. La Delivrande War Cemetery, Douvres, Calvados, France.